I bet that friendship lasted up until dinner time! I'd read about this one! Pretty amazing story!! That shouldn't last long... but it's very cute! the snake is in malting. 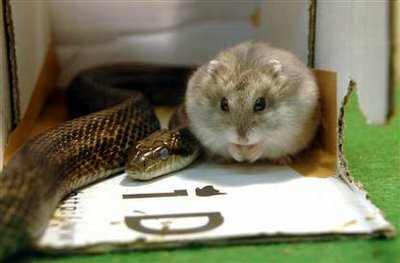 As soon as that snake is able to see (once it has shed its skin), That hamster is dinner! Been searching the web for this photo!!! (Although I thought it was a big yellow snake...?) Anyway, thanks so much. I keep these type photos under a file I call Nature at It's Best, and include a photo sometimes when I'm writing about how unnatural is the habit humans have developed of not being able to get along with their own species. 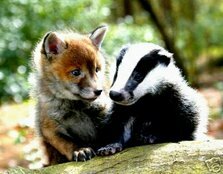 I use the photo to illustrate how intelligent animals are...in that they can even bond across species lines. Thanks again, I'll share photos I find, and check back to see what you've run across. Yanno, every friendship has a shelf life. Some have the shelf life of Twinkies, which last forever; others, they've got the shelf life of dairy products. I guess no one told him not to play with his food, eh? You can see the fogged over eyes on the snake which indicates it is about to shed it's skin. Most snakes will not feed while in this condition. Clearly, you would not want to be in that hamsters position after that skin comes off. yeah, right! next thing you know, hamster is gone. you'll never know where it goes..haha! ask his friend, snake..
Is it my imagination, or is that hamster praying? WOW....-imagine that! would be so nice not to eat the little hamster...This is def. a classic! more like Me hugging a wild lion...(i wldnt try that one);0)! Everyone already said what I was thinking: that relationship can't possibly last long! great pic! i fell sorry for the little fuzzy guy!!! Snakes don't need to see their prey. They have a killer sense of smell. They also still eat when they are shedding. Perhaps this particular snake just isn't hungry at the moment.